Gov. Henry McMaster often talks about how great South Carolina is for business. He often talks about the importance of attracting new businesses and building the private sector to create new businesses and jobs. But in his address, during the state's 97th inaugration ceremony, the 71-year old Republican also talked about the importance of a quality education and protecting the state's enviroment- connecting them back to ensuring South Carolina continues to experience economic prosperity. 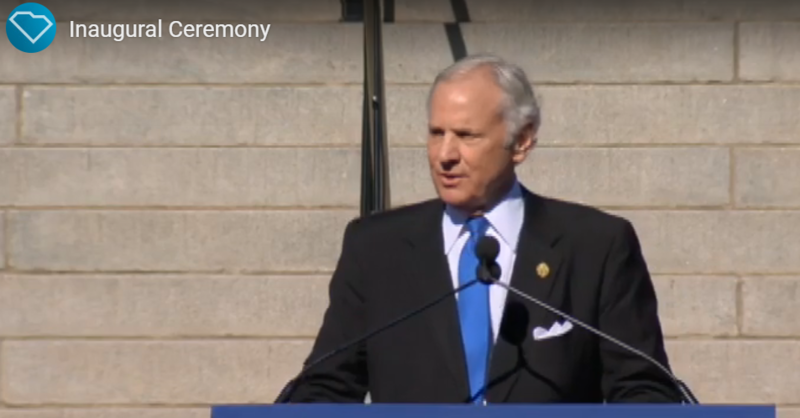 Wednesday marked the beginning of Henry McMaster's first full, four-year term as Governor. The Columbia native inherited the state's top job after Gov. Nikki Haley resigned in 2017 to become U.S. Ambassador to the United Nations. Since then, McMaster has announced over $8 billion in new capital investment and more than 27,000 news jobs. During his speech, McMaster said today's economic competition is the greatest the world has ever known and promised to lead South Carolina to more financial prosperty. "This is Our Time. South Carolina is winning. And we will keep winning." The governor used Clemson University's recent championship win to illustrate his game plan of being bold in "coaching a team of talented players." "My game plan for South Carolina requires changing our offensive plays on education. It means putting a strong defense on the field that tackles regulations, keeps high taxes off the field and protects our environment like it is the end zone." The nation's top exporter of tires - and of completed automobiles. Average annual manufacturing employment growth is 16% - the highest in the southeast. McMaster said in order to continue to accelerate economic prosperity, the state must "keep taxes low, eliminate suffocating regulations, and invest in infrastructure." LISTEN: During his inauguration address, Gov. McMaster talked about what's needed to continue economic prosperity. Understanding the link between a quality education and economic prosperty, McMaster also said the state must embark on bold reform in education. ...South Carolina's commitment to education must be second to none in the United States. " intellectual capacity, training, research and development, knowledge, innovation and imagination. In a word, on our brain power. That is why South Carolina's commitment to education must be second to none in the United States. " The 117th governor said the state must recruit and build the best team of teachers and educators in the country. He did acknowledge, accomplishing this would requre paying teachers more money. McMaster ended his speech with an appeal to protect the state's environment, in which he called "our spectactual natural resource." Recently, McMaster established the South Carolina Floodwater Commission to provide guidance, solutions and opportunities presented by inland and coastal flooding. "Economic prosperity requires that we address water in a comprehensive fashion - whether it is flooding, sea rise, aquifer depletion or upstream withdrawal. Make no mistake – a plentiful water supply is essential to our manufacturing, agricultural and tourism industries as well as our quality of life – so we must work diligently and intelligently, and we must plan for the long-term." WATCH: Complete coverage of the 97th inauguration below.